Women investors are consistently better at investing in shares than men, a survey has said. The study, by financial website Digital Look, said women were more successful because they tended to back a balanced portfolio instead of more risky stocks. The average woman's share portfolio grew by 17% in the year to 27 May, the survey found, while the average man's rose by just 11%. Over the same period, the FTSE Allshare index climbed by 13%. The survey - which analysed more than 100,000 portfolios - found that women built up balanced share collections, favouring leisure, food and drink, and utility firms. In contrast, men tended to favour stock market "fads", backing stocks in sectors such as mining and oil and gas. These shares are more vulnerable to wider price swings, Digital Look said, and have lost ground in recent months. 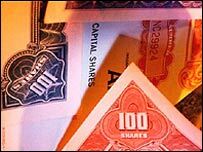 The study noted many men have "had their fingers burnt" by not building up a balanced portfolio of shares. The same survey last year produced similar results, with the average woman's portfolio rising 10% - compared with a 7% rise in the FTSE Allshare index and a 6% climb in the average man's share collection. A previous survey in 2001 had also found women outperforming the market. "While men tend to take more risks with their hard earned savings, women take a more balanced and considered view, and time and again it pays dividends," said, Andy Yates, director at Digital Look.